Guided Hand explores the use of haptic augmentation in developing new artistic tools for sculpture. By using the Haptic Phantom Touch’s ability to snap to virtual points in physical space and snap to surface boundaries of virtual models, it allows for the hand to be physically guided. 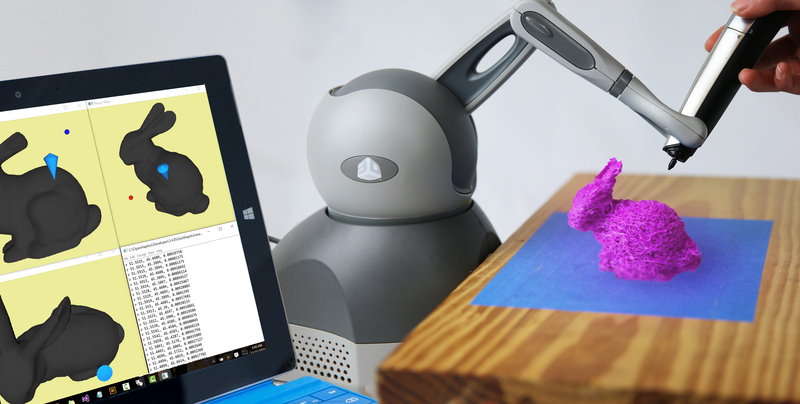 A 3D Pen is fixed onto the Phantom so that the guided hand can 3D print at a higher efficiency, allowing for drawing on virtual boundaries that do not physical exist. The Geomagic Touch is the haptic feedback device being utilized to create the effect of a three-dimensional ruler, constraining the user’s movements and providing haptic textural effects. 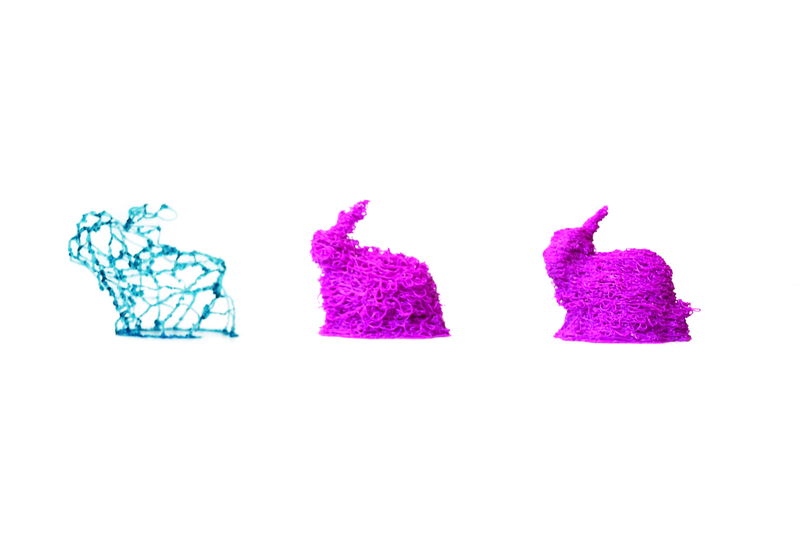 By adding a layer of accuracy and efficiency while maintaining a variable level of freedom, the 3D pen has the potential to be used on a more refined level for fabrication, sculpture, and design. Force feedback for freehand 3D printing changes the creation process entirely, allowing for a symbiosis of the design and fabrication processes, bringing back the art of craft and physical design that designers have lost in the digital age. With this system of the designer and robot working collaboratively, new ideas can be explored in such a way that is not possible with either working alone. 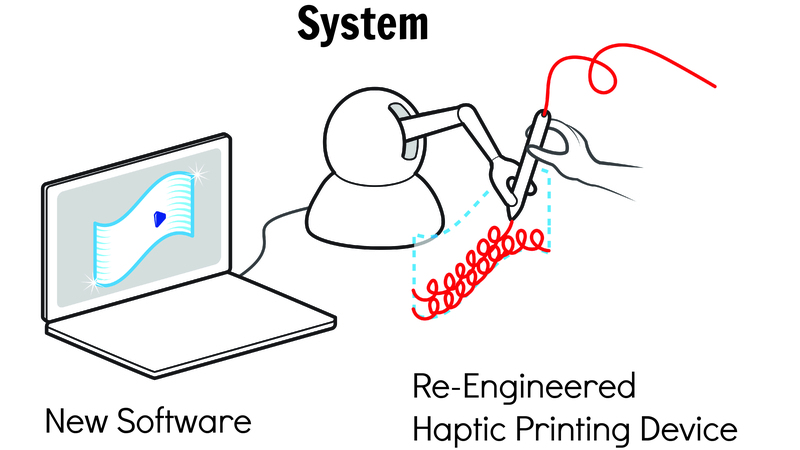 Artists and designers can take advantage of the strengths that the 3D printing pen maintains combined with the ability to skillfully craft within the limitations of a haptic feedback device, creating and iterating designs and functional products in a rigorous and interactive design workflow. Such augmented virtual/physical process allows limitations on the print by guiding the hand, thus allowing the designer to focus more on the design, worrying less about how to be accurate. It takes advantage of digital accuracy but maintains enough freedom to make way for the valuable hand-craft process. Guided Hand potentially opens up an entirely new method of working in the design phase. Additionally, it allows for multiple designs to be directly output based on the same virtual model, so that an artist can iterate through many ideas, all the while maintaining consistency. Guided Hand was created with support from a microgrant from the Frank-Ratchye Fund for Art @ the Frontier (FRFAF) — an endowment founded to encourage the creation of innovative artworks by the faculty, students and staff of Carnegie Mellon University. With this fund, the STUDIO seeks to develop a cache of groundbreaking projects created at CMU — works that can be described as “thinking at the edges” of the intersection of disciplines. Yeliz Karadayi is an MFA student in the School of Art at Carnegie Mellon University. More information on the project can be found at the artist’s website.